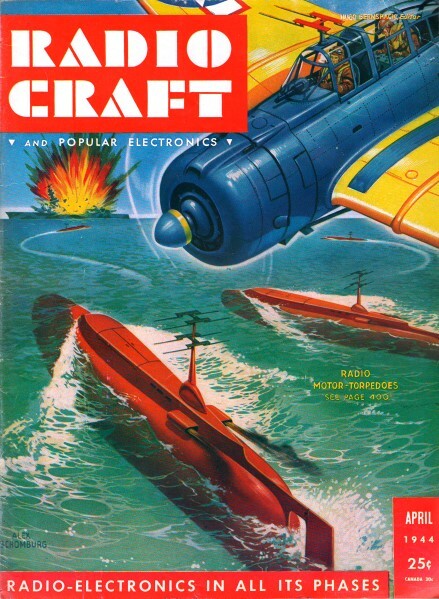 Sally Mason was the soldering iron-wielding heroette (heroine sounds too much like the narcotic) of Nate Silverman's "Sally, the Service Maid" series that ran in Radio-Craft magazine during the years of World War II. 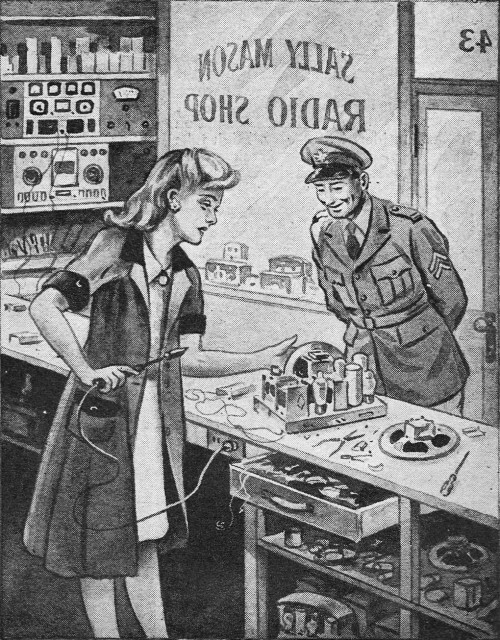 As I noted in the previous episode, many of the nation's women were left behind to run their husband's, father's and/or son's electronics sales and repair businesses when they went off to save the world from aggressive Communists, Socialists, Maoists, Nazis, and other nasty types. Some of those ladies had already become very adept at troubleshooting, component replacement, and aligning radio and television sets, while some were left to learn at the School of Hard Knocks. Sally's father, Gus Mason, as far away teaching electronics to Signal Corpsmen for the war effort. Her years of looking over Dad's shoulder and hanging around the shop was paying off as she regularly tackled and tough problems. Wiping the perspiration from her face with a bruised, well-rounded forearm, Sally Mason looked at the Emerson table model radio in deep disgust. The derned thing had been much better, even with that old speaker. Even the torn speaker cone had reproduced speech and music with greater volume than the brand new speaker she had installed. For the hundredth - or was it the thousandth? - time she carefully checked all of the plate and screen grid voltages. Yes, the 3.5Z5 output was. normal; all other voltages were low. But why? She glanced at the new sign on the window of her radio shop: Sally Mason, Service Maid, it read. A peculiar feeling suddenly crept over her. She never could explain its source. Was it the Strauss melodies coming from the radio receiver she had just repaired? Dad liked Strauss waltzes. Somehow, she always thought of Dad when she heard Strauss. "Now, let's not get panicky, dear," she thought she. heard Gus Mason's deep voice saying in his quiet manner. "There is no such thing as a radio being perfect - and not performing at peak efficiency. That old old cry of despair: "Everything tests perfect, only the radio ain't! Now let's calmly think it over. V-e-r-y c-a-l-m-l-y." "Okay, Dad - " Sally rubbed her eyes. But Dad was teaching radio to Signal Corps trainees a thousand miles from home, and Sally was on her own. A year in radio school and another in Dad's shop had taught her much theory. Dad, she recalled had said something about "too much theory." Still unable to completely overcome the weird feeling of awe, she tried to calmly survey, the job at hand. A five-inch electro-dynamic speaker, in spite of its badly torn cone - doubtless a loose voice coil as well - had performed better than the new five-inch electrodynamic speaker she had installed in its place. True, the new speaker, in spite of lower volume, did sound better - less distorted - but the volume was gone. And no reception from the weaker stations she had heard on the old speaker. What could have gone wrong? At least a dozen times she had traced the four speaker leads. She had even made ohmmeter checks to make sure the color code was the same on both speakers. Yes, color code was the same. And the field connections were correct: From 35Z5 cathode to 50L6 screen. Output transformer leads went to plate and screen of the 50L6. Of that much she was certain. And the new speaker, of a different make, fit perfectly in place. What could possibly be wrong? "I-I-I beg your pardon, Miss. May I speak to the Radioman?" Sally looked up at a solidly-built young man in uniform. The uniform, she decided, was all that had saved him from the tongue-lashing he so richly deserved. Didn't she have enough trouble already? "I," she said coldly, "am the Radioman. There's a war, y' know." He touched his corporal stripes on his sleeve and nodded. "Oh, I'm sorry!" she said. "What can, I do for you?" "I'd like to buy a high-impedance Antenna Coil. Or, if you have the separate windings, the antenna winding, I'd like to buy that, please. From the shelf she brought down the desired coil and he bought it. "That T, under your Corporal stripes - Technical Corporal ?" "N-no, Ma'am. I used to be a Ham. But my regular work was in a garage. Automobile mechanic. I'm in the Armored Division. Fixin' Tanks," he said with a grin, "isn't so different from the work I've always done." Sally pushed back the loose strands of dark brown hair which seemed determined to get into her eyes. "My Dad is an Instructor. Radio Instructor. And I'm doing my poor best to keep the shop running until he's back. I wish he were here, to help me." The Corporal glanced at the sign on the window and a slow smile did wonderful things, Sally thought, to his tanned young face. "What seems to be the difficulty?" he asked . Sally invited him to listen .to the Emerson. For a while he tried to tune in various stations. Then he tested all of the voltages. Shaking his head he remarked: "Low voltages, everywhere except at the rectifier output. The 50L6 could be shorted." He tested all of the tubes. "No; not in the tubes." With the set disconnected from the line, he used an ohmmeter to check for leaky condensers. Then he asked her to use the voltmeter. "See the large voltage-drop across your speaker field. Too high!" She made the reading. "But how do you know? I have no schematic on this set; don't even know the model number." He grinned. "You don't have to. We have nearly 120 volts coming out of our rectifier. That is what is going into the speaker field. By the time it comes out of the speaker field, our voltage is low. As we have no shorts of any kind, isn't it obvious that our field is to blame? The speaker is perfect ... yet, it isn't! It will do you more good, if you, not I, find the rest of the trouble." Sally carefully examined the speaker, paying particular attention to the field. That is where the Corporal had said the trouble lay. She sadly shook her head. "I don't see it." "Here - check the old speaker," he said gently. And, please ... let's do it v-e-r-y c-a-l-m-l-y." Sally was startled; so very much the way Dad talked! "Just a hint - check all of the speaker-resistances. Check and compare the ohmic values - resistance in ohms - of both output transformers and both fields." In a few rnoments Sally exclaimed: "Why, the old speaker field reads about 450 ohms; the new one is 3,000 ohms!" Dan smiled at her. "That's it!" "But why? Why should it make so very much difference?" He scratched his blond mop of tousled hair. Well, suppose we figure this out mathematically. To make it easier to do mental arithmetic, let's say 100 mils flowed through our field. That's not true, of course. Even if 100 mils flowed through the 450-ohm field, the current through the 3,000-ohm field would be less. Do you know why?" After some thought Sally said: "I think so. As the other tubes get lower plate and screen voltages, it's obvious that they'll draw lower cathode currents." "Right!" His smile .pleased her tremendously. "So we know the current through our two fields will not be the same. But let's assume it will be - only to make the mental arithmetic easier. Shall we? And let's make the absurd assumption that 100 mils flows through our two fields. Then, what is the voltage-drop across each field? And 100 mils is one-tenth ampere." Sally's brow became corrugated. "Let's see - Ohm's Law ... in the 450-ohm field we have one-tenth times 450, or 45-volt drop. And, in the 3,000-ohm field-"
"-Our voltage drop will be higher, in these impossible figures, more than the total voltage! But please continue." "Well, one-tenth amp. times 3,000 ohms - why, that's a voltage drop of 300 volts! Nearly three times our actual voltage!" "I know; but this is what happens when we do too much assuming." Sally grinned. "I have learned a great deal. And thank you, very much, Corporal Dan Bryner ... Sir." "Only officers, Miss Mason, are addressed as Sir." An awkward silence followed, until Dan said; "Let's now try a speaker with a 450-ohm field." A long search failed to unearth the correct speaker. "One moment," he said. "The field in the old speaker is okay, isn't it? Well, let's use it." Dan removed the pole pieces from the two speakers; installed the old field in the new speaker, carefully aligning the voice coil. Then he marked the field they had no present use for and put it on the shelf. The Emerson warmed to operating temperature and performed beautifully. Sally was ill at ease. She removed the money Dan had given her, from the cash drawer: "I do hope you will, please, at least accept that Antenna Coil as a - er-well, you know." Dan picked up his package, waved and said: "See you next. month." Sally shook her-head: "Such a nice boy! And the Palace has such a ·perfectly swell movie, tonight!